This was a really fun, fairly quick, project that I made this week. I already gave you a sneak peek the other day of the first 'quilt as you go' panel that I made for the lunch box, and now I can show you the finished item. I mentioned the other day that I recently started a bit of a casual/on-call job in the office at my kids' school. I won't have a ton of shifts, but when I go I will need to bring a lunch and the plastic shopping bag I used the other day was not good enough! For this bag, I used a tutorial by Svetlana, which I would definitely recommend. The finished size of my lunch box is approximately 8" high, 9.5" wide, and 3.5" deep. Definitely big enough to hold enough food for a lunch, probably even including a few containers if necessary. 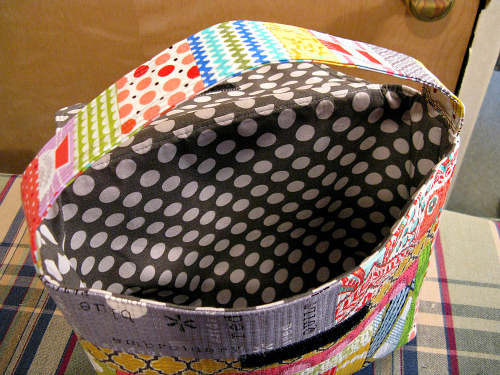 Close-up of some of the fabrics used on the back (above) and front (below) of the lunch box. ......and the nicely finished bottom corners which Svetlana outlines very well in her tutorial, if you've never done this method before. It allows the lunch box to stand on its own. I go to work twice this week and will definitely enjoy using my new lunch box. Love, love, love it! Such fun fabrics. It's gorgeous. So bright and cheerful. I'm sure it will have many admirers. Looks great! I really enjoy your blog and the quilts you've made this year are very similar to my tastes. Are you on Vancouver Island? My cousins wife is from Nanoose Bay, and my parents travelled all around there in July, all the way from Australia. Small world! What a great lunch bag! Love the colours. Ooh scrappy perfection! I love that super dense quilting too, looks amazing! What a fun lunch bag! That will really liven up the old PB&J! And congratulations on the new-ish job. Getting to work in your kids' school sounds fun! Nicely done Heather! You'll be the envy of the "lunch room"! This goes on my list of favorite makes!! Love the stitching! What a lovely lunch box! I am going to check out the tutorial, maybe I need one too. Ooo! that came out so nice! LOVE, LOVE, LOVE this!! All of the other ladies will be so jealous! I make my daughter's lunch box every year and I see that next year, her's will HAVE to be QAYG. You made my/your scraps look so good! Love it!! LOVE this bag, Heather! 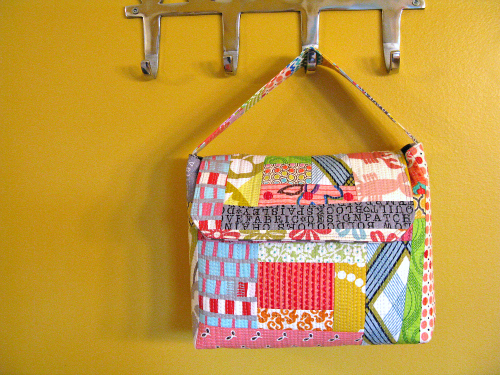 So fun and what a great use of scraps! Fabulous bag - so bright and colourful! Very cute! I'm sure it will put a smile on your face at lunchtime! That one scrap of Pearl Bracelet looks great against the matching wall colour! Love this - especially with the cool polka dot interior. You should put one of these in the store! Great little bag, I was thinking awhile back that I am needing a new one for myself! A good thing you found a way to do the short handles! Your lunch bag is super cool. Love the fabrics. 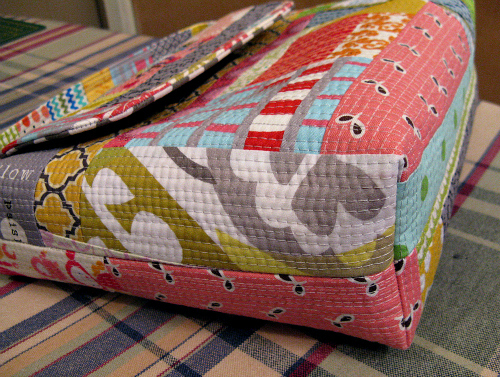 hopping over from CC, lovely bag, great colors and Quilty..
very cool. you'll be one stylin' office aid! Holy smokes!! That is flippin' cute! 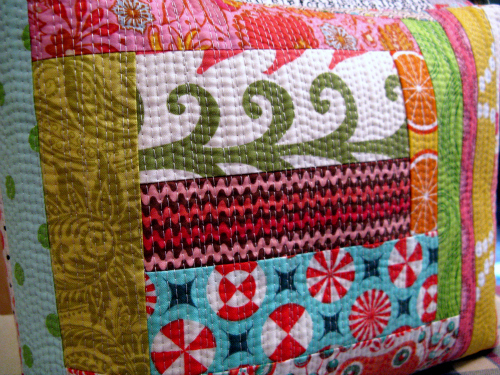 I love the bright colors and random piecing. Something as cute as this might actually get me motivated enough to bring lunch to work :). I'm sure lunch tastes twice as good from a bag like this! Very nice! This is so cute!! What a great Lunch bag!! Love it!! Looks awesome! Wonderful work. I keep meaning to try QAYG. Yours turned out so well. 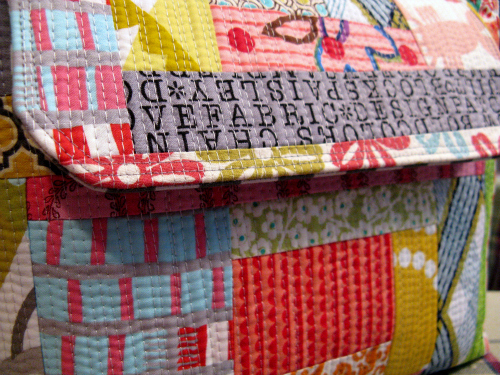 I just love the patchwork look and the stitching that runs through it is such a pretty detail! Totally Adorable!! I love it! Thanks for sharing the tutorial too! That is the cutest lunch bag I've seen! That is so adorable - and practical too! What a cute little lunch bag, nicely done! Amazing bag! Love the quilting! ohmygoodness, this is YUMMY! 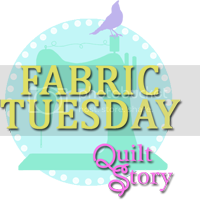 i love the scrappiness, and the heavy straightline quilting sets it off perfectly! Heather, I don't know how I possibly missed this post but this lunch box is so totally adorable!!!!! Love all your modifications, I think it looks wonderful with that shorter handle and the qayg scrappy is of course simply amazing!!!! Your bag is gorgeous! I saw it on Pinterest this morning and came by for a peek - I love the patchwork and the QAYG quilting - you did a really lovely job on this!